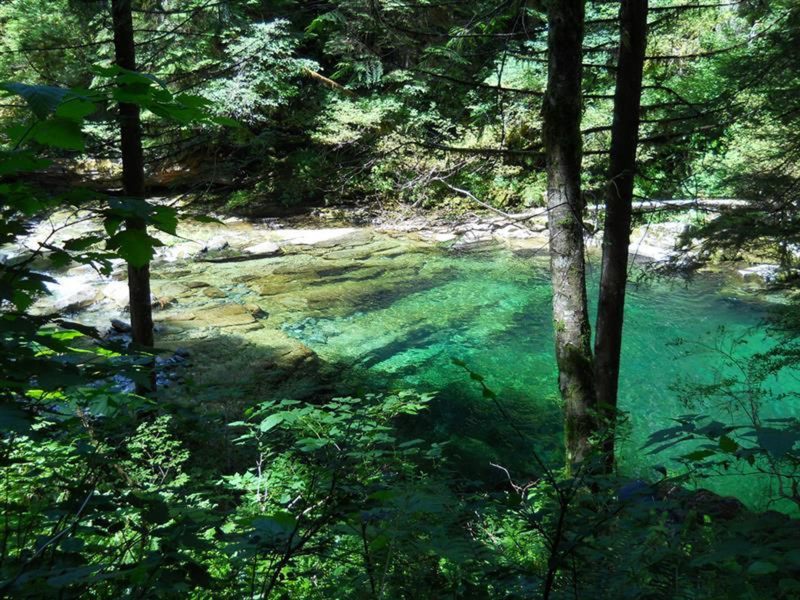 Emerald green waters, huge trees, lush understory with moss and ferns, and really great hiking trails are just some of the things you'll find near Siouxon Creek in the Gifford Pinchot National Forest. The Siouxon Creek drainage (pronounced sou-sawn and rhymes with Tucson) is situated south of Mount Saint Helens in the wonderfully vast Gifford Pinchot National Forest. 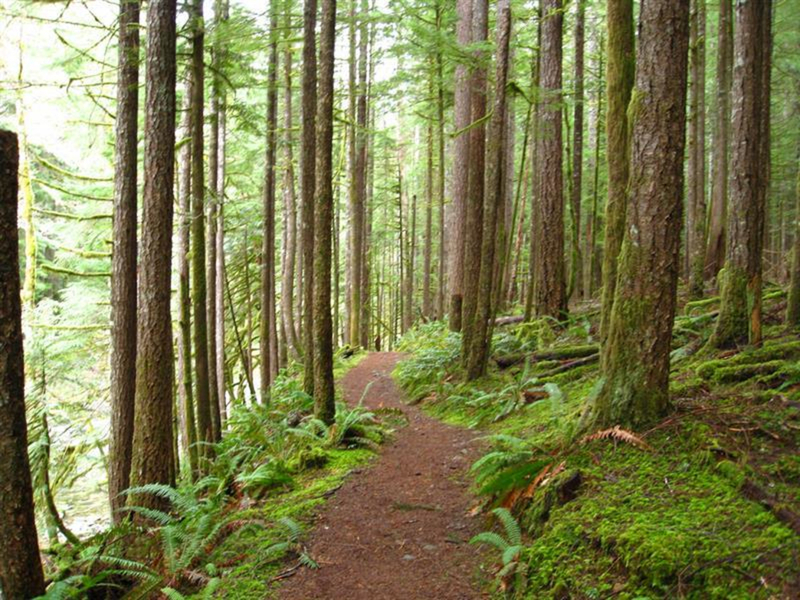 Some of the Portland area’s finest old growth forest is located in this drainage and the Siouxon Creek Trail runs through a prime sampling of the area. The path parallels its namesake for roughly 7-miles before leaving the creek for good. 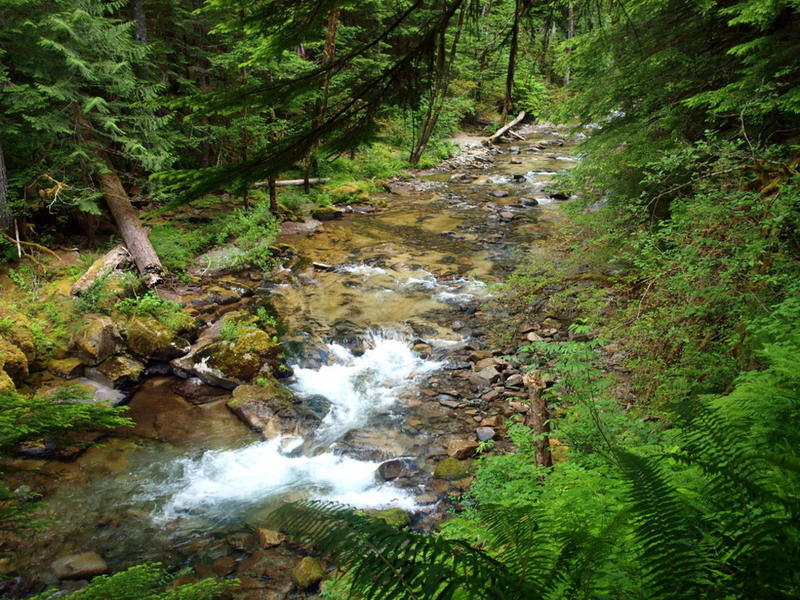 From the trail, you get excellent views of the clear running waters of Siouxon Creek. You can observe the creek rushing briskly over boulders, plunging over cascades, and collecting in deep emerald green pools (aka swimming holes), which are all accessible from the trail. The trail described above takes you to some of the main waterfalls in the area. The Siouxon Falls is two miles in on the trail, which is a beautiful waterfall that plunges 30 feet through a narrow cleft into a pool that is great for swimming in the summer. Many people hike to the bridge over Chinook Falls, which is not only gorgeous, twice as tall is Siouxon Falls, and pours wide over the rock ledge, but is also a great place to turn around because the creek crossing at this point can be knee deep. Some people continue forward and ford through the creek to continue up the Wildcat Trail to get to the beautiful Wildcat Falls. For the more daring, another ford through the deep water at Wildcat Falls crossing to return to the trail makes for a shorter trail length. The hike using the cut through at Wildcat Falls is 8.2 miles and the backtrack from Wildcat Falls is 9.8 miles. The forest here comes with all of the wonderful attributes you expect to find in an old growth setting: big trees, clear water, and an understory so lush you could imagine spending a lifetime just taking it all in. There are numerous camp spots- all varying in level of privacy and water access and some are large enough to entertain multiple tents. The trail is well graded and is not difficult in terms of elevation gain, which makes it ideal for families. 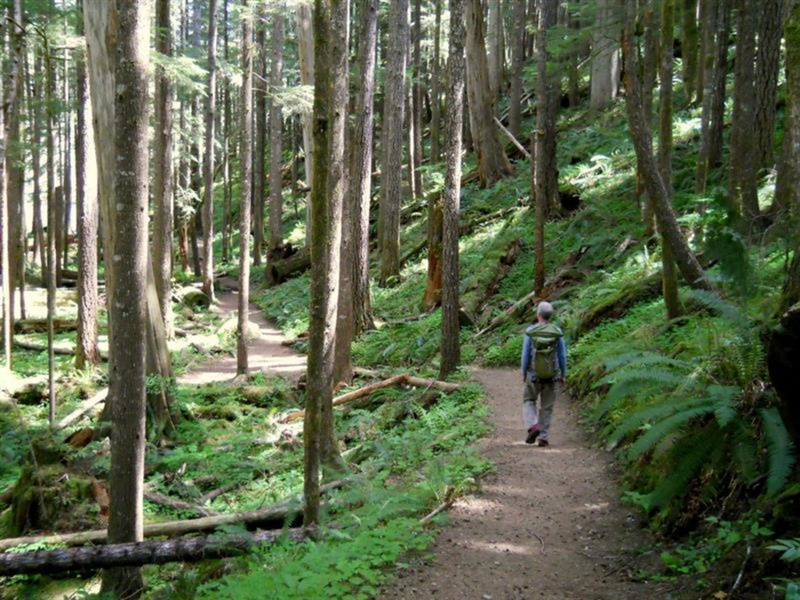 The low grade of this hike makes it accessible for hikers of all experience levels. The only concern would come with the creek crossings, which are not kid friendly and may make some hikers uncomfortable, though the water only comes up to most hikers’ knees. Besides that, most people will enjoy the absolutely beautiful hike surrounded by gorgeous waterfalls. To get there from Portland, take I-205 north to Hwy 500 East. Travel along this road that soon becomes highway 503. Make a left to stay on Hwy 503 North, through the towns of Battleground and Amboy. Just past the Mt. St. Helens National Monument Headquarters, turn right onto NE Healy Road. After 9.2 miles bear left at a fork heading uphill onto Road 57. After 1.2 miles, turn left onto paved Road 5701. Drive 3.7 more miles to where the road ends at the trailhead. The trail heads down into the forest about 100 feet before the end of the road. Be forewarned there are a number of “gottcha” potholes and dips along the last 10 miles to the trailhead.